I have Ghostwalk here at home and will get to it at some point. The Ladies of Grace Adieu sounds quite interesting even though I am not a short story fan usually. I keep meaning to read Jonathan Strange and Mr. Norrell. Sigh. Too many books. Thanks for the reviews. Kay, I don’t usually find short stories very satisfying. I think that’s my problem with the Poe Tales. The stories in the Ladies of Grace Adieu are longer and the characters are a bit more developed. I enjoyed them more than I thought I would. Jonathan Strange and Mr Norrell is at the opposite scale – it is so, so long and detailed. It took me ages to read it.Yes, there are far too many books and not enough time to read them all. Do read Gaiman’s Stardust – the original story about Wall. Neverwhere is full of wonderful characters and set in a London we don’t see. American Gods and its sequel Anansi Boys feel more like American novels, but I’d wholeheartedly recommend them.Ladies of Grace Adieu and Gaiman’s Fragile Things are on my TBR pile – thought I’d have a story from each for Hallowe’en. I loved ‘Ghostwalk’ but didn’t get on at all with ‘Jonathan Strange and Mr Norrell’. Perhaps I should try the ‘Ladies of Grace Adieu’ and see if I have any greater success. I also have problems with the Poe tales, but used to read them with my first-year Under-grads because they made the point I need to make. I have to say I haven’t missed them this first autumn of retirement. 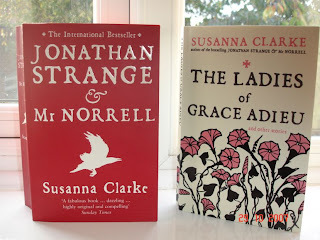 I really do want to read Susanna Clarke–both books. I also have Ghostwalk on my list. I read a few ghost stories as well, but I really didn’t find them scary, though several were very creepy. I wonder if it is just the times we live in? Or maybe being an adult? I haven’t been scared by anything I’ve read in a very long time. And I am still working on trying to finish my lone book for the challenge. Ironic, really, that Strange & Norrell was the book I talked about in last week’s BTT about Abandonded books. I realy couldn’t stand that book (grin).